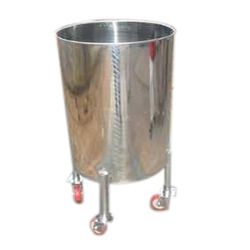 We are a reliable supplier & manufacturer of SS Storage Tank & Storage Tank. Our product range also comprises of Stainless Steel Furniture, Stainless Steel Stand and Stainless Steel Storage Products. These products are highly demanded due to their corrosion resistance. We have in stores Storage Tank for our esteemed clients. These tanks are developed using high-grade required steel metals and birch woodland & latest technology in line with the defined parameters of the industry. The offered tanks are molded by making use of compounds such as polypropylene that ensure their ability to withstand heat. Furthermore, our products can be availed in variegated sizes, finishes and designs at an economical price. Looking for SS Storage Tank ?